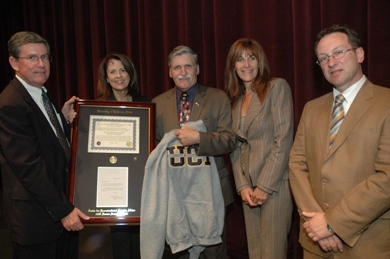 Lieutenant-General the Honourable Romeo A. Dallaire, retired, was presented with the 2006 Human Security Award on October 11, 2006. Featuring a keynote address by LGen The Honourable Romeo A. Dallaire, (Ret). Members of the Orange County community gathered on Wednesday, October 11, 2006 for the Human Security Award Ceremony at the University of California Irvine. The ceremony featured "Human Rights in a Complex World,"a keynote address by Lieutenant-General the Honourable Romeo A. Dallaire, O.C., C.M.M., G.O.Q. M.S.C., C.D., (Retired). During the keynote address, General Dallaire was presented with the 2006 Human Security Award for his heroic actions to save lives and protect the vulnerable in Rwanda in 1994, while serving as U.N. Force Commander, and for his subsequent efforts to educate, support and provide leadership to the world community on pressing humanitarian issues. The Human Security Award recognizes the remarkable efforts of people working to empower and protect the world’s most vulnerable communities. General Romeo Dallaire is recognized as an advocate of peacemaking, peacekeeping, and peacebuilding in the world’s most war-torn regions. 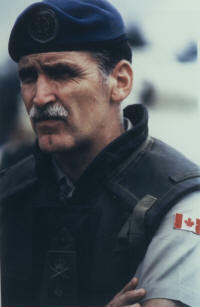 For the public at large, nationally and internationally, it was following General Dallaire’s appointment as Commander of the United Nations Observer Mission- Uganda and Rwanda (UNOMUR) and the United Nations Assistance Mission for Rwanda (UNAMIR) on 1 July 1993 that the name Dallaire became synonymous with courage. In recognition of his exceptional leadership and ability during that mission he was awarded the Meritorious Service Cross. General Dallaire was summoned to the Senate of Canada on March 24th, 2005 where he continues to write and speak out against human rights abuses, genocide and ethnic cleansing. He continues to focus on human rights and the plight of war affected children in articles and lectures in Canada, the US, the UK, Europe, and Africa. In April, 2006 he was appointed to a United Nations Advisory Committee on Genocide Prevention by the Secretary-General of the United Nations. Lieutenant-General Romeo Dallaire is recognized as an advocate of peacemaking, peacekeeping, and peacebuilding in the world’s most war-torn regions. For the public at large, nationally and internationally, it is following General Dallaire’s appointment as Commander of the United Nations Observer Mission- Uganda and Rwanda (UNOMUR) and the United Nations Assistance Mission for Rwanda (UNAMIR) on 1 July 1993 that the name Dallaire has been synonymous with courage. In recognition of his exceptional leadership and ability during that mission he was awarded the Meritorious Service Cross. On his return to Canada, he assumed the simultaneous appointments of Deputy Commander of Land Force Command and Commander of the 1st Canadian Division. In 1998, he was promoted to the rank of Lieutenant-General and appointed Assistant Deputy Minister (Human Resources-Military), followed by an appointment as Special Advisor to the Chief of the Defence Staff for Officer Professional Development. General Dallaire was medically released from the Canadian Forces in April 2002. General Dallaire is an Officer of the Order of Canada, Grand Officer of the National Order of Quebec and has been awarded the United States Legion of Merit. He is also the first recipient of the Aegis Award on Genocide Prevention, the United Nations Association of Canada’s Pearson Peace Medal. His recently published account of the 1994 Rwandan genocide Shake Hands with the Devil – the Failure of Humanity in Rwanda, has earned international recognition as well as the 2004 Governor General’s Literary Award for Non-Fiction and the "Shaughnessy Cohen Prize"for political writing awarded by the Writers’ Trust of Canada. While a Fellow of the Carr Centre for Human Rights Policy, the John F. Kennedy School of Government, Harvard University he conducted research in the areas of conflict resolution and the elimination of the use of child soldiers. General Dallaire was summoned to the Senate of Canada on March 24th, 2005. Senator Dallaire continues to write and speak out against human rights abuses, genocide and ethnic cleansing. He continues to focus on human rights and the plight of war affected children in articles and lectures in Canada, the US, the UK, Europe, and Africa. In April, 2006 he was appointed to a United Nations Advisory Committee on Genocide Prevention by the Secretary-General of the United Nations. We would also like to thank the Canadian Consulate General of Los Angeles and the Government of Canada for their ongoing support of our research and education on human security issues.